iNaturalist projects are collection of records posted on iNatualist. Now that we have a R package rinat from rOpenSci I thought of playing around with the data. Here is a function I wrote, to quickly map all the records of a project using ggmap package. We can used get_inat_obs_project function from rinat package to get all the observation from the specified project. get_map function form ggmap package to download google maps base layer and ggplot function form ggplot2 package to actually plot the map with points. Now call to the function with a group name will produce a map with all the records in the project. We can use other ggplot options to add title, legend etc. to the map. This is just a simple example. When I attended usrR! 2012 last month, there was an interesting presentation by Dr. David Kahle about the package ggmap. It is a package built over ggmap2 and helps us map spatial data over online maps like Google maps or Open Street Maps. 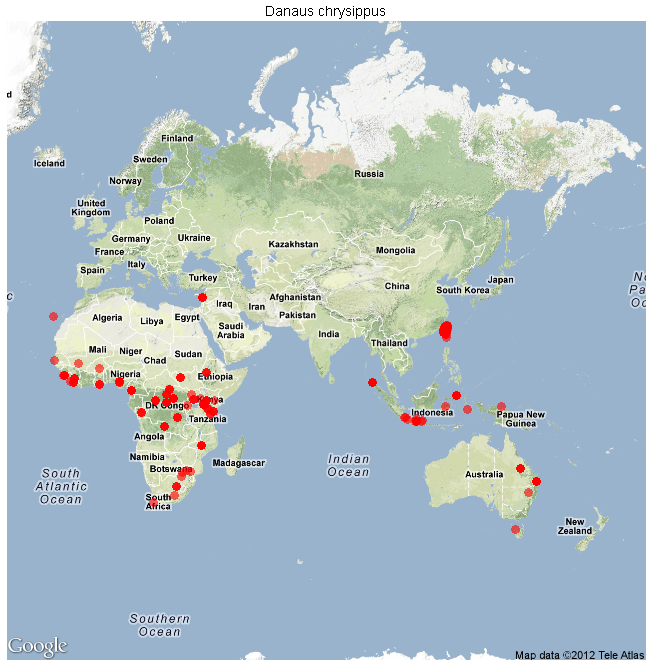 I decided to give ggmap package a try with biodiversity data. So first let us create a map for the Plain Tiger or the African Monarch Butterfly (Danaus chrysippus). We use occurrencelist from rgbif package again like previous post. We use qmap function from ggmap package to quickly pull up the base map from Google Maps. So in essence the qmap function eliminates two step process of getting map data using map_data function and then setting up map display using ggplot function into one step. We use geom_jitter function to plot the occurrence points in the specified size(size = 4) and color(color = “red”). Though in earlier code we have used geom_jitter, high density of the points in some regions are not clearly seen. If we want to get better idea about the number of points we can try two dimensional density maps using the stat_density2d function. 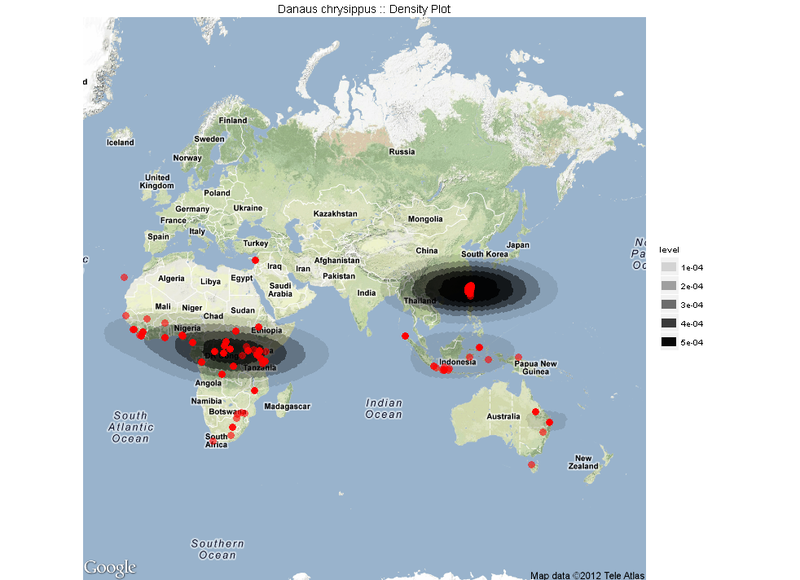 It just adds density lines on the map showing higher density with darker circles.